As a full-service law firm, NHLA offers our clients legal advice and information, representation in all of New Hampshire’s state and federal courts and before several state agencies, and advocacy at the New Hampshire Legislature. In the legislative forum, we lobby for policies that reduce poverty, promote the well-being of low-income people and senior citizens, and enhance access to justice for all. We target our work toward policy proposals for which NHLA can provide specialized expertise grounded in practical experience representing clients. Our legislative work includes monitoring proposed legislation and rules, presenting oral and written testimony to administrative agencies and House and Senate committees, and negotiating and collaborating with policy makers and other stakeholders. NHLA focuses our legislative work on policy and budget proposals that impact basis needs, in areas including housing, health care, subsistence benefits, domestic violence, and energy/utilities. 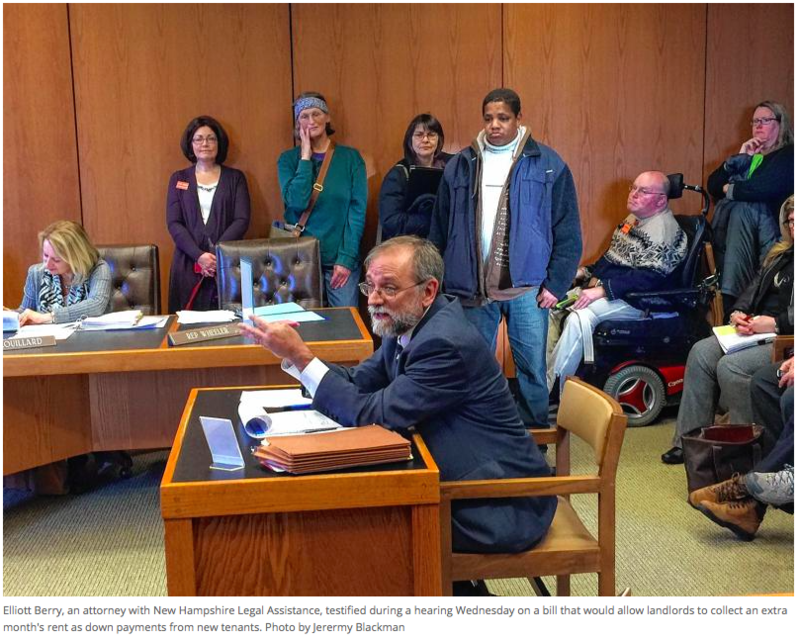 The changes will be “expensive to administer and cause confusion, chaos and loss of coverage for thousands of people,” according to Dawn McKinney, policy director at N.H. Legal Assistance, which advocates for low-income families. According to McKinney, almost 17,000 people have lost their Medicaid coverage in Arkansas since September, due to that state’s work requirement. Students of color, who make up about 14 percent of the general student population, comprised about 23 percent of student suspensions. Students with disabilities, who make up about 20 percent of the population,comprised around 40 percent of students suspensions. "What's even more concerning is that students of color who also have a disability are 5.5 times as likely as their white non-disabled peers to be suspended out of school," says Michelle Wangerin, a member of the Juvenile Justice Reform Group, and the Youth Law Project Director at New Hampshire Legal Assistance. The law mandates lead testing for all New Hampshire kids aged 1 and 2, though parents can opt out. It also lowers the blood-lead level at which the state will intervene, and creates a loan fund to help landlords deal with lead paint issues. Thank you to the New Hampshire Senate for tabling a bill that would have helped no one and could have created new and overwhelming difficulties for our state’s low-wage workers. Former NHLA clients speak to the NH Senate Commerce committee about how more notice would help New Hampshire homeowners benefit from federal programs to avoid foreclosures. Allowing landlords to collect a security deposit and first and last months' rent at the same time will raise barriers to low-income renters, advocates said.